Students at Banbury Academy are hard at work putting the finishing touches to their annual summer musical which takes place this weekend. Thirty students ranging from Year 7 to Year 13 make up the musical’s cast and team which this year is Sister Act. For the first time the students will take their show on the road with three performances at St Mary’s Church in Banbury’s Horse Fair. Ben Coleman, Banbury Academy performing arts teacher and director of the production, said: “Over the years I have tried to push the cast and crew further in order to give them an experience like no other. 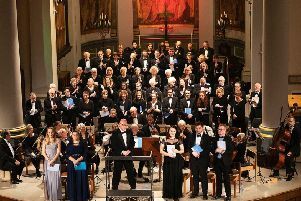 “This year we have taken on the hugely ambitious challenge of performing a fully staged musical in one of Banbury’s most beautiful landmarks; St Mary’s Church. The musical is based on the 1992 film of the same name starring Whoopi Goldberg and tells the tale of a wannabe star who believes she has the world at her feet until her boyfriend commits a heinous crime and she has to go into hiding. Sister Act takes place at St Mary’s Church, Horse Fair, Banbury, on Friday, June 29 at 7.30pm and on Saturday, June 30 at 2.30pm and 7.30pm. Tickets are available here or from the Banbury Academy Reception.